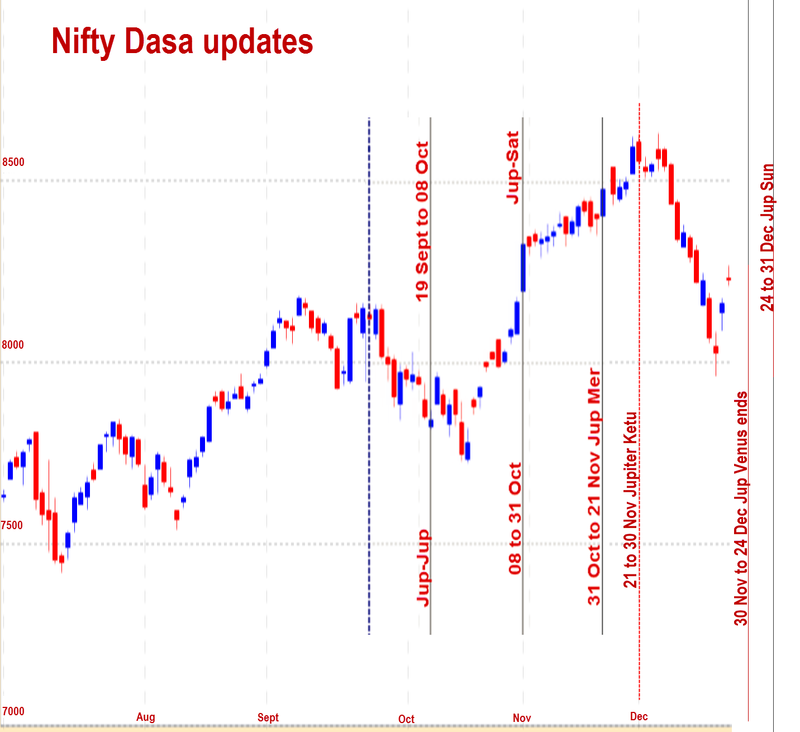 Last week we did comment that any bounce if it happens, it could be the result of Sun trine Jupiter.Nifty and the world markets bounced from their lows, the reason this time was that Fed declared it would be "patient" with respect to interest rate increases.We had also expected 8300 or 8350 to be first level targets. Sun and Jupiter were trine on December 15, 2014. 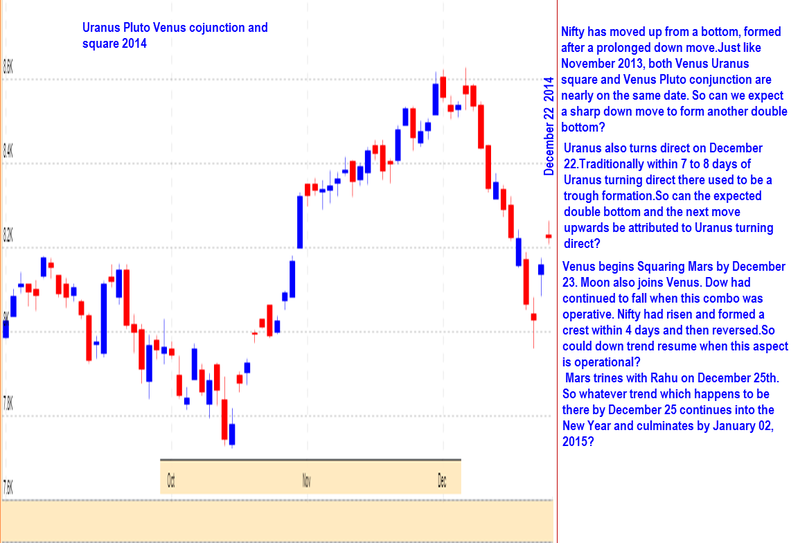 By December 17, we saw Nifty bouncing from a bottom of 7961.This was the last aspect involving Jupiter. Hereafter Uranus aspects take over. On December 22, Uranus turns direct.It continues to be in close square with Pluto.Meanwhile Venus starts squaring with Uranus and conjunct Pluto. It will also start squaring Rahu and Ketu. On December 23, we see Moon also joining the Rahu Venus Ketu trio. Also Rahu forms a trine with Mars. On December 24 to 26, Mercury starts becoming conjunct with Pluto and square Rahu and Uranus. On December 27, Moon joins with Uranus and becomes a powerful translator of Uranian energy. On January 02, 2015, Mars begins to oppose Jupiter retro. On January 04, 2015, Sun conjuncts Pluto and squares Uranus, Ketu as well as Rahu. This means we are in for a heavily energised period. Since Uranus is involved we may expect sudden high movements upward and also reversals downward.Extreme care is required in the markets now. We might see a reversal to form another bottom and then market rising into the New Year. Venus moves out from 5th house to 6th house. She showed a positive upmove from 7961.Now since Sun also is in 5th house when the sub period starts and moves on to 6th house, we may expect another upmove to start by December 26th. 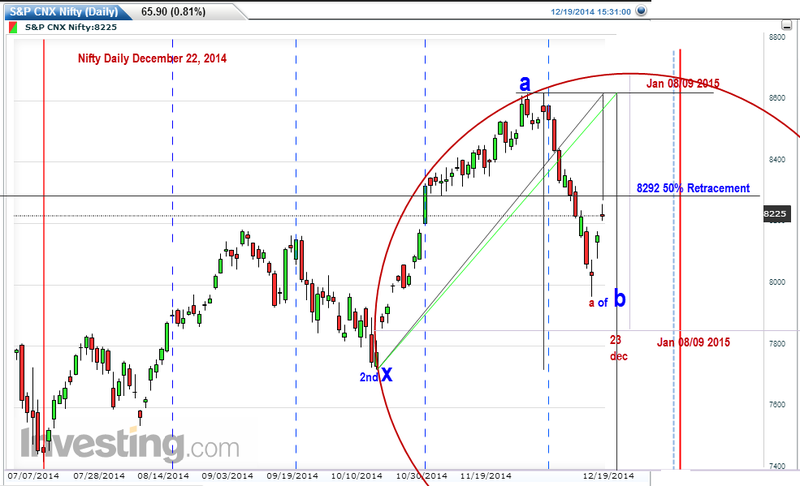 we are in wave b of a of b which had started from the low of 7961. 50% retracement level comes to 8292.This is a critical level. Nifty could turn down again from this level.another attempt at a bottom cannot be ruled out.Remember, we are in the corrective phase of the upmove from 7724 to 8627 and the near term has not fully turned positive yet. Sustenance above 8292 is a must. Since the down move from 8627 has nearly come down by 80% we need to take this upmove only with caution. Another factor is the momentum charts.Reverse divergence has been seen in the daily charts, but keep an eye on the weekly charts as well. Despite all the hungama,it has still not bottomed out. This could be a crucial week from that angle. 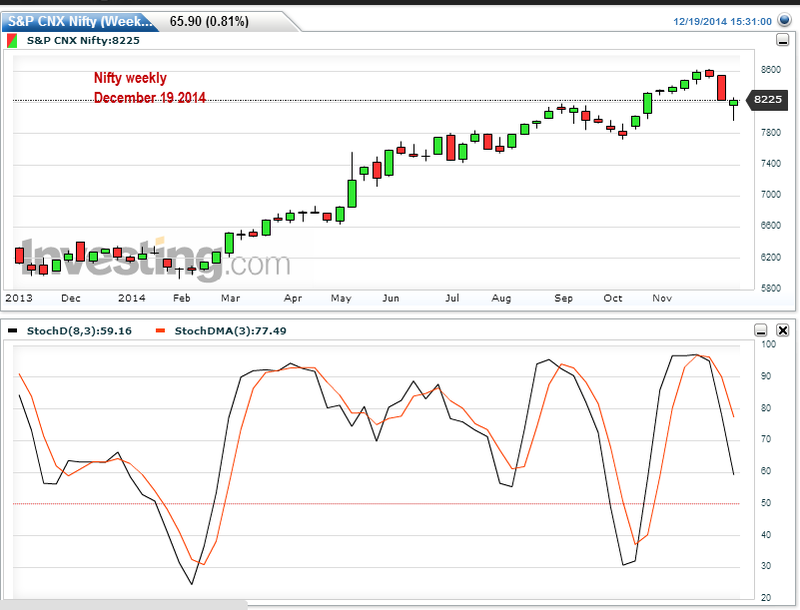 Once Weekly bottoms out, we can expect a sustained recovery or upmove. Trade carefully.Year end is approaching. It had been a great year from an investment and trading perspective.Let us strive to complete this year on a very happy and positive note. 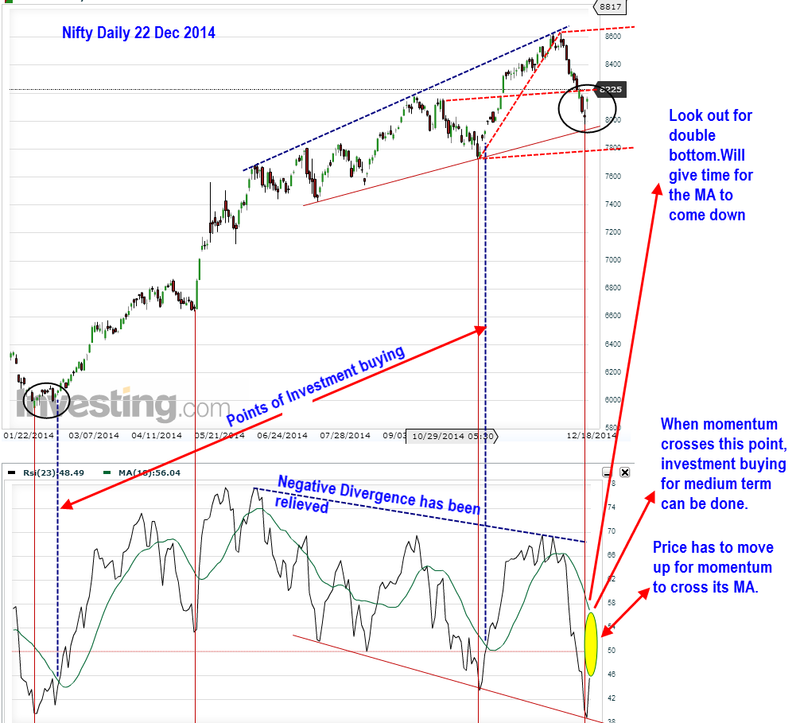 Nifty Dec 23 A triangle in the making?